With backflow device theft on the rise, protecting this equipment keeps customers happy and has a positive social impact. Security cages protect clients’ irrigation backflow devices from thieves, who steal the equipment to sell it as scrap metal. In the summer of 2009, a Memorial Landscaping and Irrigation technician received a call from a client stating that a backflow preventer had been stolen and that somebody needed to install a new device immediately, recalls Chad Touchet, CEO of the Houston-based company. The customer asked the technician not only to replace the stolen device but to install a cage around it to prevent future theft. The technician installed the new device but had to measure the backflow preventer and order a cage to fit around the unit, since no adjustable cages were available at the time. 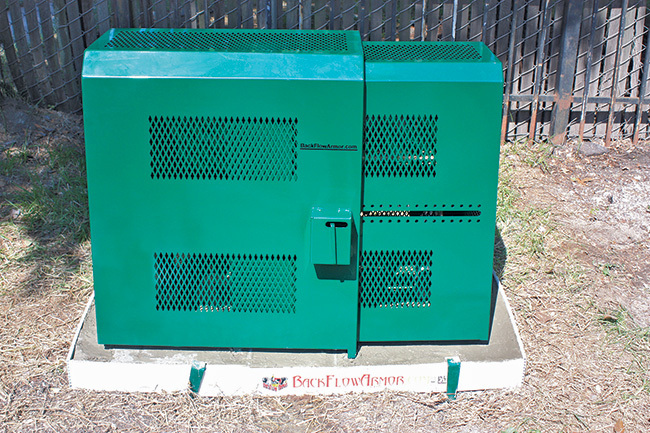 Between the time the technician installed the new device and ordered the security cage, thieves struck the property again and stole the newly installed backflow preventer, Touchet says. The incident prompted Touchet to form another company in 2011 called Backflow Armor that manufactures adjustable security cages for backflow devices. Security cages, along with other preventive measures, can alleviate the headaches associated with backflow device theft for both contractors and their clients. With the cost of scrap metal, particularly brass, rising in his area, Touchet has become accustomed to receiving such frantic phone calls from clients. He first noticed the problem in the early 1990s, but in recent years he’s seen a steady increase in the number of incidents. In 2000, Memorial fielded maybe two calls a month related to backflow device theft. Now the company receives anywhere from 12 to 15 calls per month, Touchet says. Backflow device theft is a problem contractors are dealing with nationwide. In fact, in September California Gov. Jerry Brown signed into law a bill specifically aimed at curbing irrigation-related metals theft. Thieves targeting backflow devices are netting between $15 and $70 per device, depending on the size. Reduced pressure zone backflow preventers used in environments where chemical contamination is possible, such as hospitals, typically yield the highest dollar amount because of their size, Touchet says. While theft is the most prevalent problem associated with backflow device tampering, the potential for a more sinister problem exists, he says. Irrigation systems could be bioterrorism targets. So protecting a backflow device could have a societal impact that’s much greater than saving customers money. On average, the problem costs customers $1,100 to replace each stolen backflow device, Touchet says. Thefts often occur on Friday or Saturday evening, so by the time a client realizes the device is missing as much as 100,000 gallons of water could be lost. Upfront communication with customers is one of the keys to preventing future thefts, Touchet says. He recommends contractors include information with their invoices that describes the current problem and potential solutions, including the installation of cages. These words of caution can prevent testy exchanges with customers if thefts occur. The installed price for backflow device cage is about $800, Touchet says. Distributors list the product around $549. He says contractors should seek cages with locks that are housed inside a steel box rather than those secured by a padlock and eye bolt. Eye bolts are weak and easy to cut, which does not provide good protection. In addition to cages, strategic placement of the backflow devices themselves can reduce the likelihood of theft. Contractors should try to install the backflow preventer in shrubbery so the device is not visible from the street, Touchet says. Another potential protective measure is installing the device in a pump room so it’s not accessible from the outside. “That’s the best way to protect it from everything,” Touchet says. While an indoor installation may be the safest bet, it’s not always practical. Indoor installations often require copper or other more expensive materials, costing between $1,000 and $2,000 more to install than standard outdoor jobs.